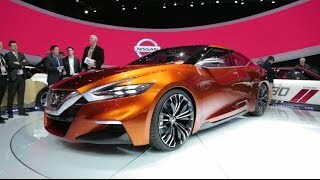 Nissan has unveiled the Sport Sedan concept, a 4-door sedan with the aura of a real sports car, at the 2014 North American International Auto Show. 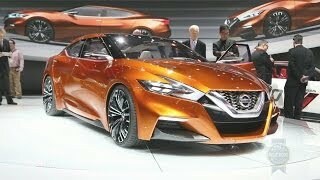 The Sport Sedan Concept previews a new energetic design direction that amplifies Nissan's legendary approach of applying sports car principles to a sedan. 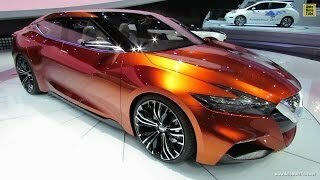 The Sport Sedan Concept shares the new V-Motion front aspect, "floating" roof and boomerang-shaped headlights and taillights. . 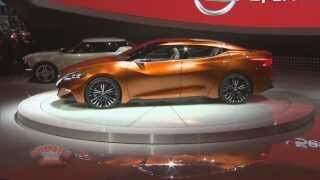 The Sport Sedan Concept rides on custom 21-inch aluminum-alloy wheels. It gets a unique "Strad Amber" paint. The interior features premium materials, with the use of diamond-shaped graphics on the quilted seats, stitching and panels enhancing the sense of dynamic motion. Rather than traditional flat surfacing, the diamond treatment adds three-dimensionality. It also features a sport steering wheel and metallic trim. The front-wheel drive Sport Sedan Concept is powered by a 300-plus horsepower 3.5-liter V6 engine backed by a sport-tuned Xtronic CVT® and features an innovative suspension layout with performance dampers.